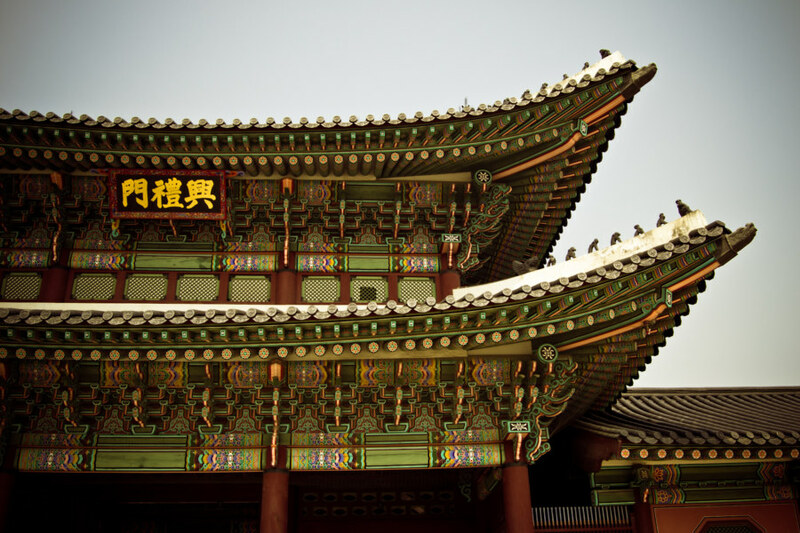 A close look at Gyeongbokgung. 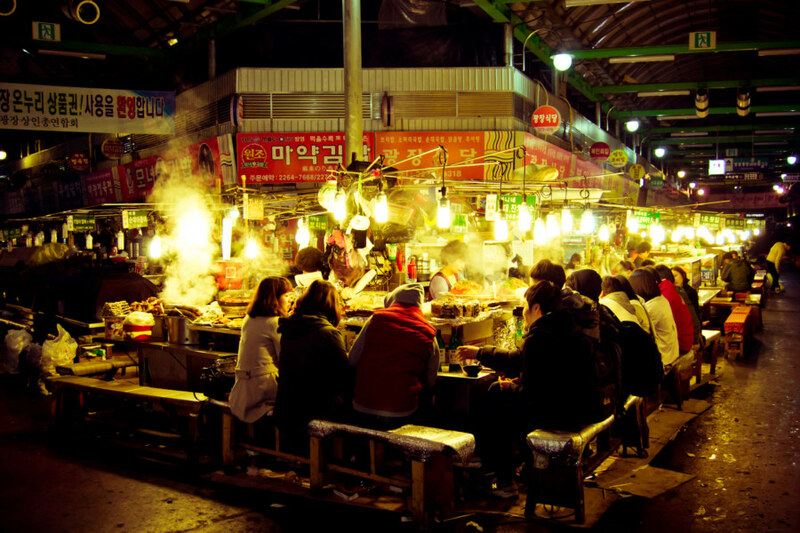 This post collects my final thoughts about my trip to Seoul, South Korea, in April 2012. 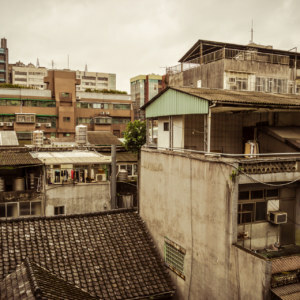 To write these posts I have been working from a series of letters I sent home to family and friends as well as some notes I jotted down while still in Seoul. Not everything fit into previous posts but there are a few things I still wish to share. Expect to read an assortment of anecdotes and fleeting impressions from the remainder of my stay in the South Korean capital. First, some thoughts about tourism in general. I do not yet consider myself to be a seasoned traveller. I spent close to three months in Asia—but this is my first extended trip outside of North America. I learned a lot about myself, exactly as one would expect. I also learned a lot about my travel style. Unsurprisingly, I am not a huge fan of the more popular tourist attractions. 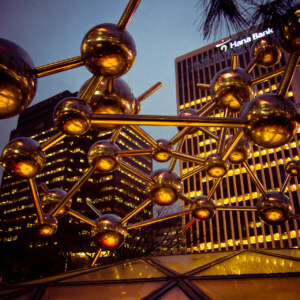 I have sampled a few in my travels but usually leave with a camera full of pretty photos and little else to show for it. Tourism, at its most banal, is the experience of transporting yourself somewhere far away to look at things, take the obligatory photos, and inject some money into the local economy before returning to your everyday life with a few souvenirs to give to family and friends. It is an extension of the consumerist lifestyle. Instead of material goods we consume famous landmarks and inauthentic side show acts, few of which I find to be especially memorable or engaging. 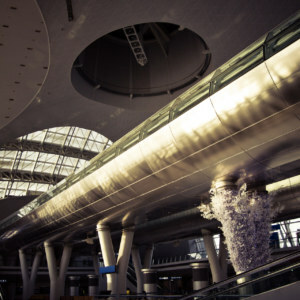 Oh, it’s nice to see these things, but this is not the kind of travel that changes me—and I do not travel to remain unchanged. When I travel I like to immerse myself in the local culture. 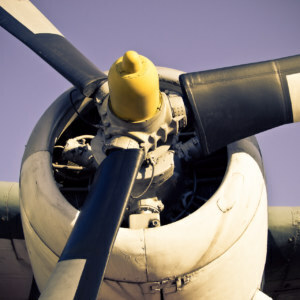 I want to see it up close. 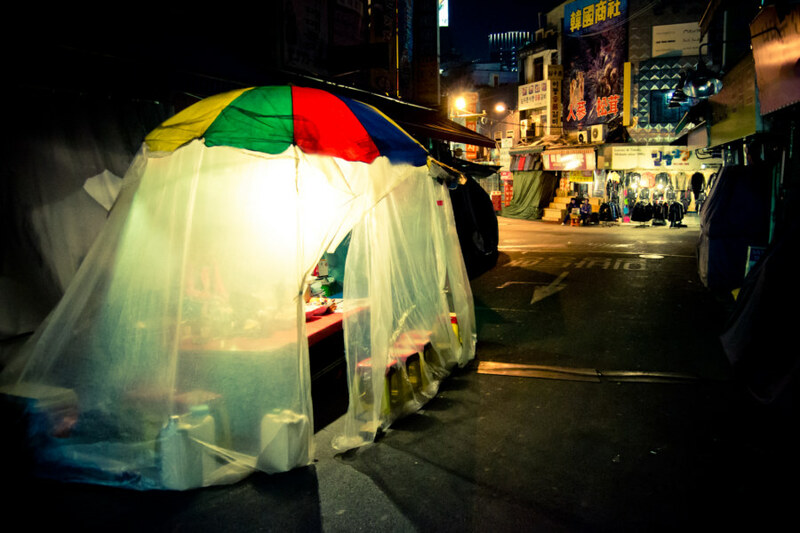 I don’t want the pre-packaged tourist experience—I want a taste of real life wherever I am. I want to feel just how far from home I am. I want to get lost. I don’t want to rush—I want to soak in the essence of a place. I don’t mind spending a day doing nothing in particular except wandering around and seeing whatever there is to see. Sometimes I make an itinerary but usually abandon it for random adventures. I would rather do stuff that appears in no tourist guidebook. That being said, I still make an effort to visit some of the popular attractions wherever I go. After all, I like to practice the art of photography! But there is more to it than that. Sometimes I find myself deeply moved by a popular attraction despite of my misgivings about mainstream tourism. Usually I am moved for strange reasons, however. 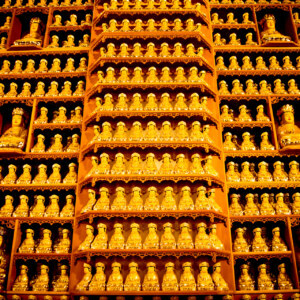 Hyangwongjeong, the pavilion of far-reaching fragrance. 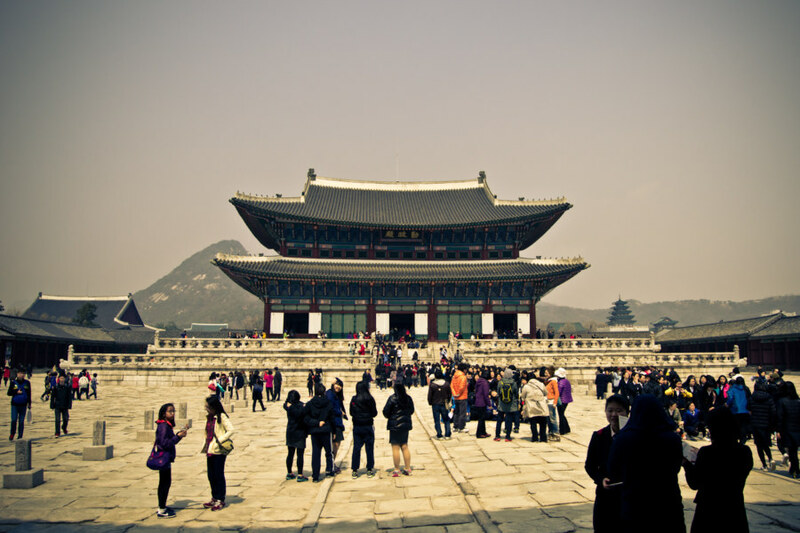 Take, for instance, my visit to Gyeongbokgung, one of the five major palaces of Seoul, and a major tourist attraction. I woke one morning in Seoul and—after a delicious sujebi breakfast—casually strolled through Gwanghwamun, the main gate to the palace, into the open plaza beyond. I picked up a pamphlet and was on my way. 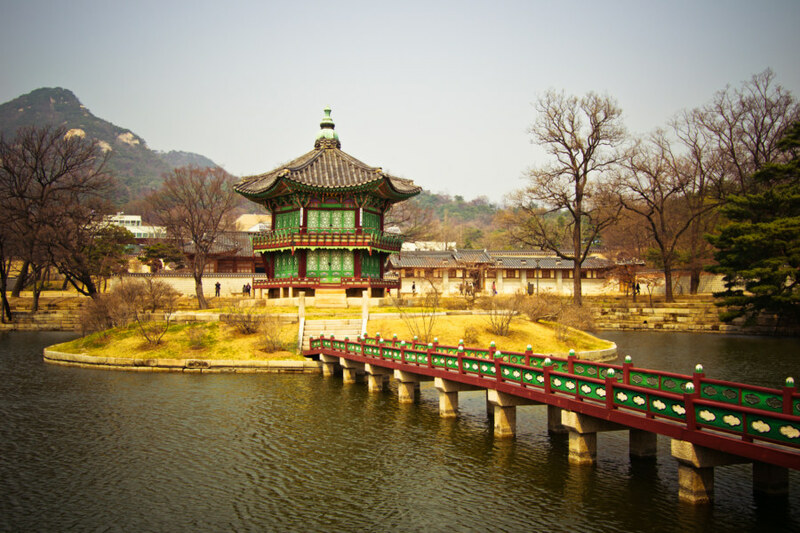 Approaching the second gate at Gyeongbokgung. 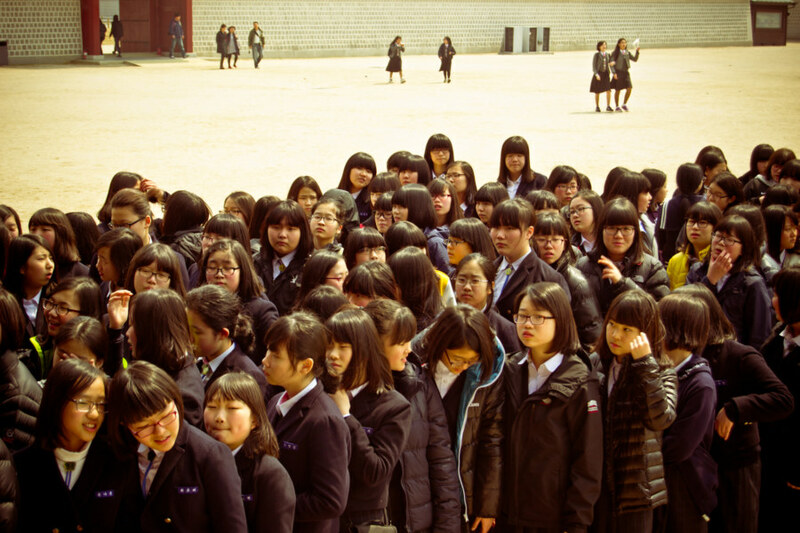 Gyeongbokgung was overrun by thousands of identically dressed Korean schoolchildren. I suppose it is a popular destination for field trips given its cultural importance. On several occasions I encountered small groups of children, one of whom would bravely blurt out “Hello!” in English before running away. I responded cheerfully, offering a deep, booming “Hello!” in response to any who would linger. A few of the children asked where I was from to which I replied, “Canada!” They would then chitter amongst themselves and say “Ah, Canada!” before running back to the rest of the group. This brought a smile to my face as I continued my exploration of Gyeongbokgung. Korean kids at the palace. Gyeongbokgung differed from the Grand Palace in Bangkok—which I had visited slightly more than a week previously—in several important respects. For starters, this palace isn’t particularly opulent. Everything is made out of painted wood and chiseled stone. Even the throne room is modestly decorated, featuring little more than gilded furniture and some nice cushions. Nothing about the place feels overbearing except perhaps the wide open spaces between buildings. 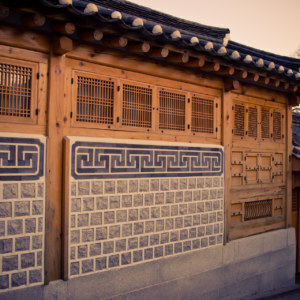 Even then, the entire palace seems optimized for simplicity, much like nearby Bukchon village. 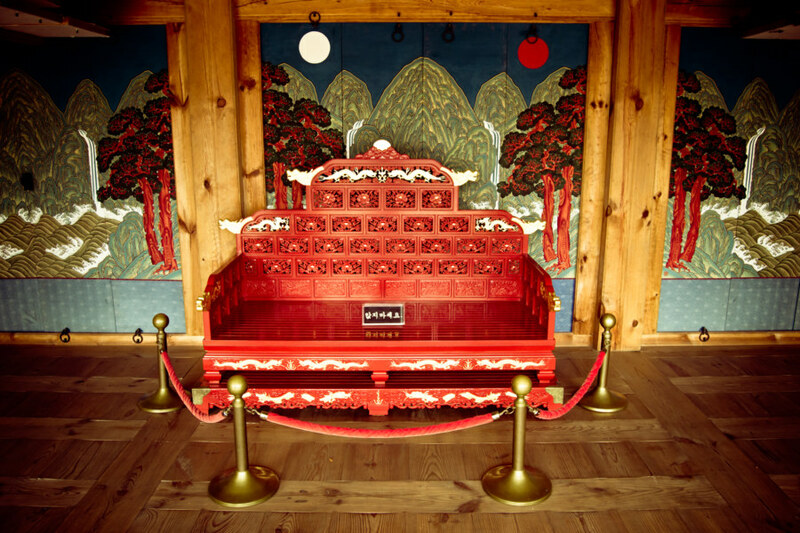 One of the rather modest-looking thrones at Gyeongbokgung. Something in the back of my mind kept nagging at me while I wandered the palace grounds. 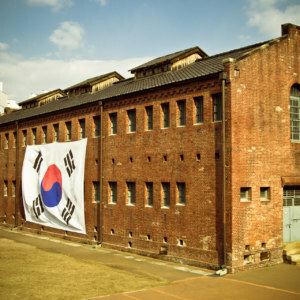 Having just spent some time at Seodaemun Prison I knew that much of Joseon-era Seoul had been demolished during the Japanese occupation. Looking around, I noted that most of the buildings seemed suspiciously well-maintained. In fact, nothing about the place felt particularly old. I flipped through the pamphlet I had procured at the gate and took a closer look. 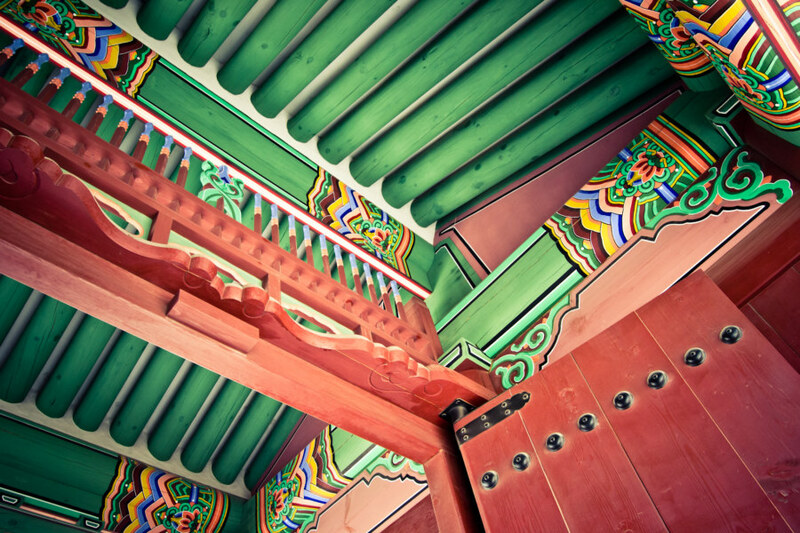 Sure enough, few of the buildings at Gyeongbokgung were originals. Most had been reconstructed from floor plans and photographs as recently as a decade ago! The entire palace was a bit like a movie set. 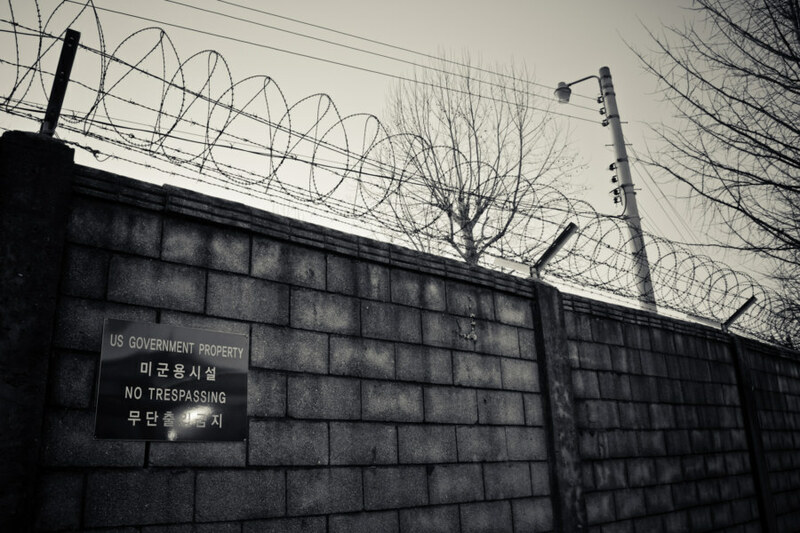 Imagine a frontier town in one of the classic westerns—this was the Korean equivalent. The stars in this drama were the Korean schoolchildren, the teachers, the actors playing the royal guards at the gate, and foreigners such as myself, here to snap phony photos of ersatz buildings that had never been used for any historic function apart from the creation of history itself! I had a real PKD moment realizing all of this. I think he would have loved this place. A close look at the ersatz palace. 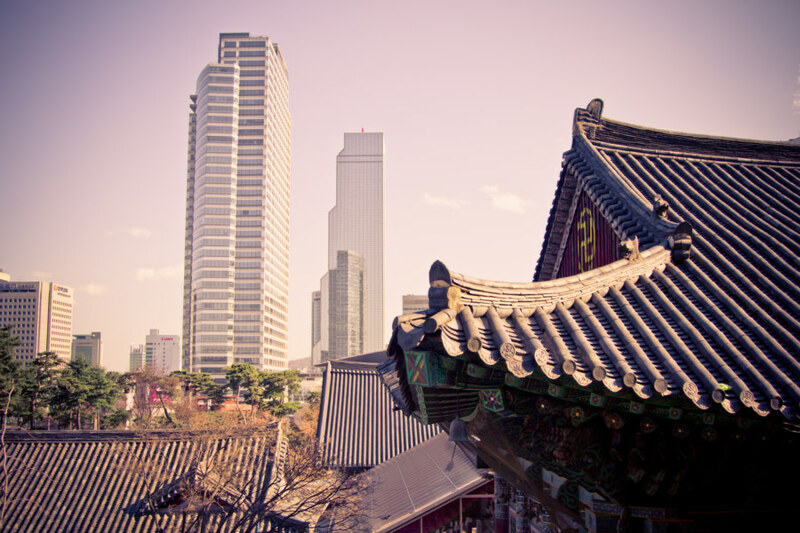 Now, not every part of Gyeongbokgung is a fake—the Japanese left a few buildings here and there. This compelled me to play a game. I spent the remainder of my time trying to discern which structures were originals and which had been fabricated solely to impress tourists and delight schoolchildren. 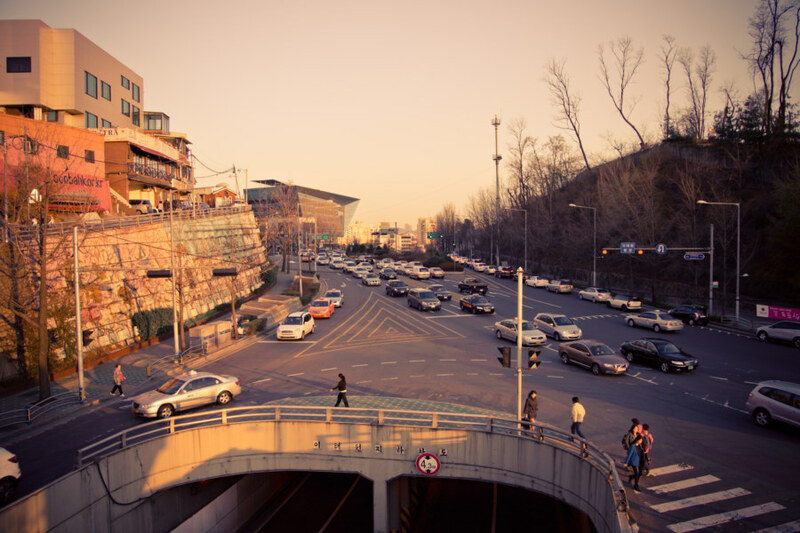 The rest of my time in Seoul was a pleasant blur. My last notable outing was to Bongeunsa temple next to COEX Mall in Gangnam. I also visited the aquarium in the mall but it was nothing to write home about. Just another tourist attraction. 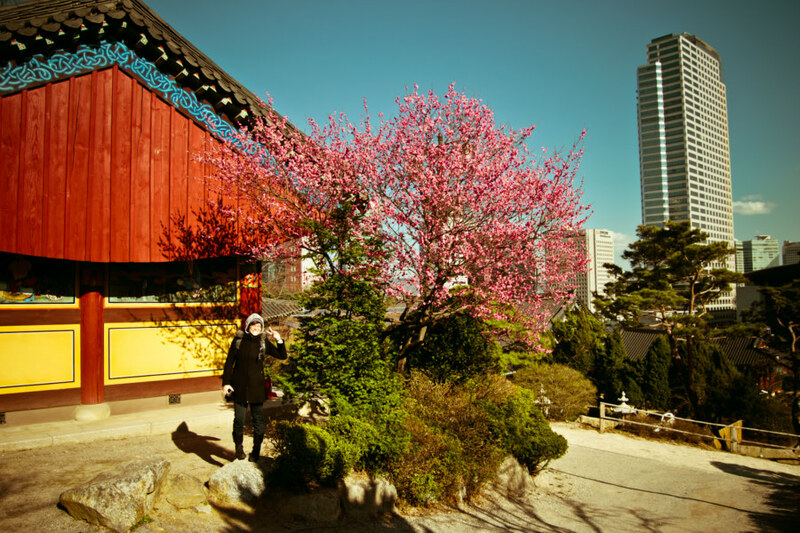 Ellen and the springtime blossoms at Bongeunsa temple. 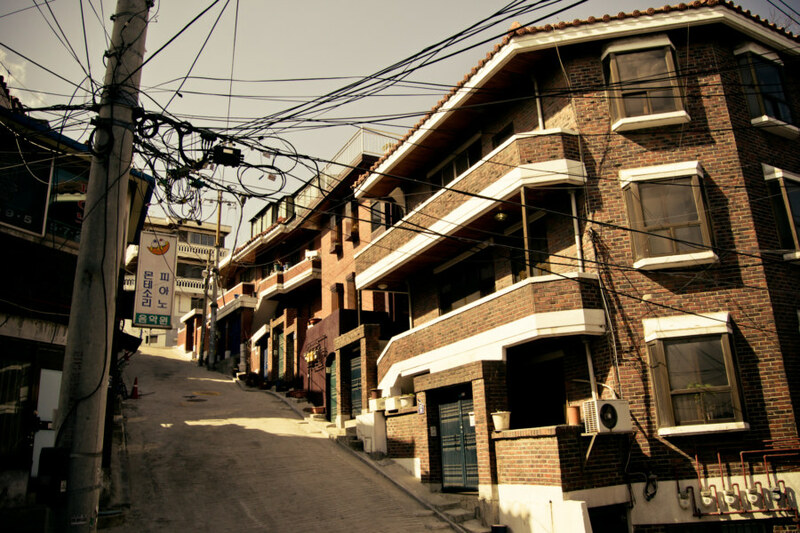 A steep slope on the way to Ellen’s place in Yongsandong. This seems vaguely familiar; have I been there before? Korean society has some growing to do. Ellen completed my crash course in Korean culture at a hip little bar specializing in makgeolli, an alcoholic beverage made from fermented wheat and rice. There I sampled five different styles of makgeolli from breweries all across the country before heading back to Ellen’s to enjoy the comfort of the ondol (underfloor heating, a brilliant invention) and one last night of dreams in Asia before returning to Canada. 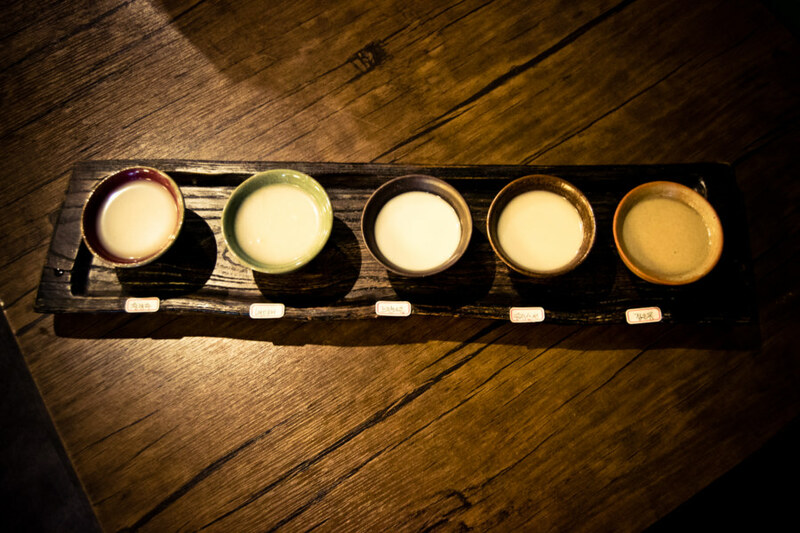 Five types of makgeolli from all across Korea. 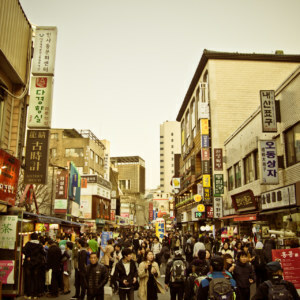 I am an accidental tourist here in Seoul. I never meant to come here; it wasn’t part of some plan. I simply asked my travel agent for a weeklong stopover in a big city on my way back to Canada from Thailand. He spun the wheel of fortune and informed me I was headed to South Korea with about three days notice. I knew little about my destination prior to arriving. I don’t know much more now that I am leaving—but I do know that I have thoroughly enjoyed my time here in Seoul. 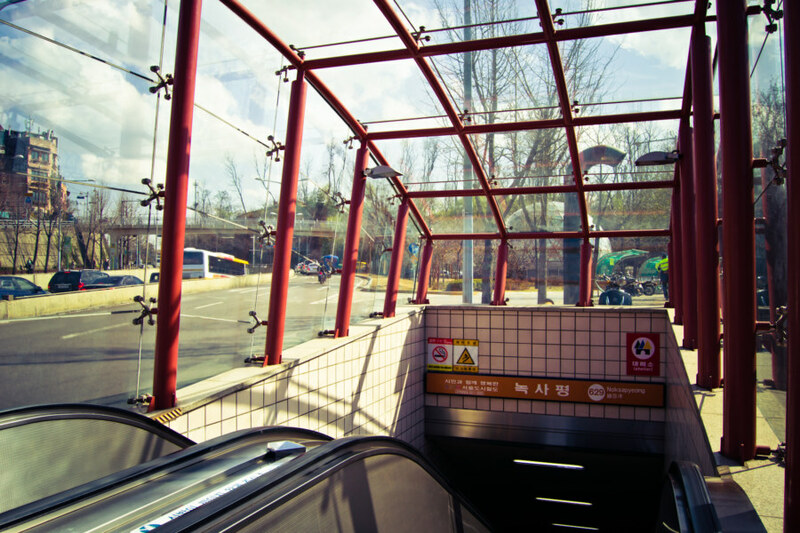 Entrance to the amazing Seoul metro. I could easily see living here for a while. The Seoul metro puts every other transit system I have experienced to shame—with the exception of Hong Kong. Korean food is shockingly good; I didn’t eat anything I disagreeable and it’s always been great value for the money. Even the snacks are good, from puffed wheat niblets to this strange sort of toffee that I am chewing on while I draft this update. 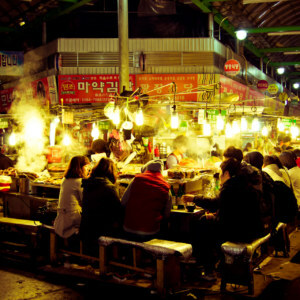 One of the many late night street kitchens of Seoul. Prior to visiting Korea I was warned that the people here can seem somewhat cold and standoffish with foreigners. This has not been my experience. It may be that I play the part of the bumbling white barbarian in a particularly charming and endearing way, but most people I have interacted with here were warm and friendly. It probably helps that I have learned to smile when unsure of what to do. 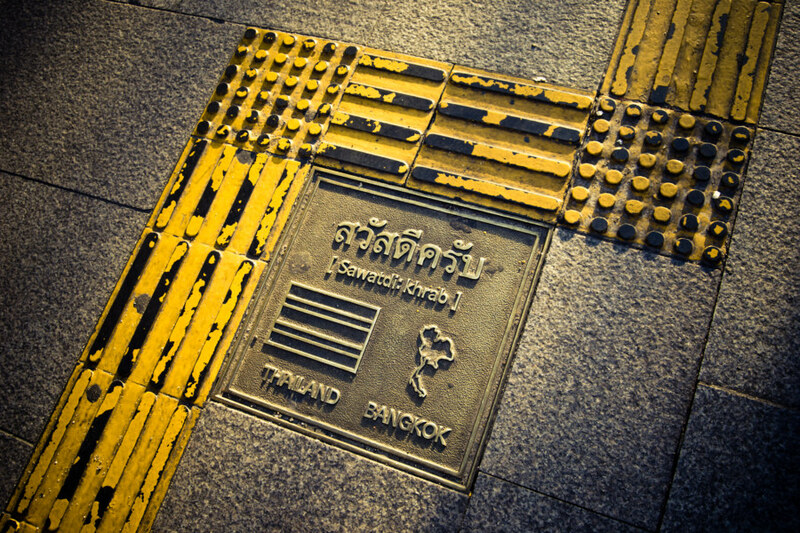 That’s a habit I picked up in Thailand and it has certainly served me well here in Korea. A language of signs and symbols pervades my dreams. Will I return? I certainly hope so. 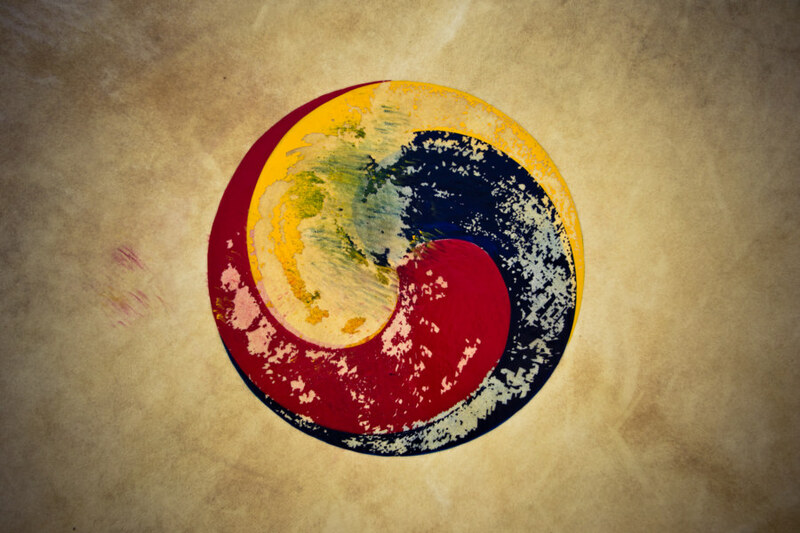 Much time has passed since I left Korea (these posts are backdated) but the experiences I had there remain at the forefront of my mind. It is, in some respects, the last place I was truly carefree and unaffected by the dark times that would fall upon me after my return to Canada. 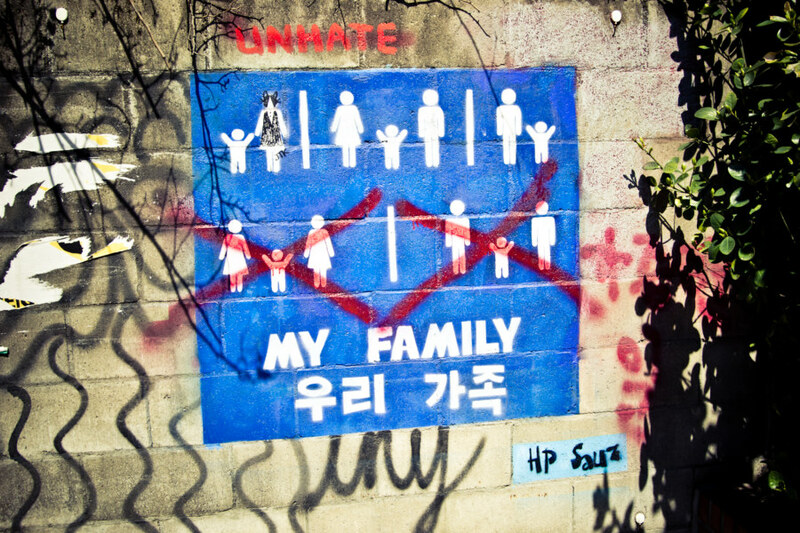 For this reason alone Seoul has occupied a special place in my inner world of signs and symbols. 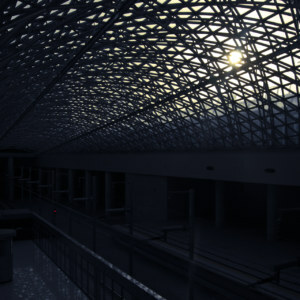 Perhaps I idealize my experiences there a bit much—but I would certainly like to return some day. A lovely sum up – thanks again for sharing. Amen to finding an authentic experience of the country (most often the people! ).